The new Inox-F15C-ULT3 15 inch panel PC from BVM is housed in a monolithic 304 stainless steel enclosure sealed to IP69k, the most demanding environmental protection specification. Designed to be installed in environments such as the food processing industry, where it will be subjected to regular high pressure, high temperature washing, the F15C-ULT3 is suitable for other applications in the industrial, marine and pharmaceutical sectors where a physically rugged self-contained PC is going to be exposed to high levels of dust, water and temperature. The unit is third-party IP69K tested with an 80°C 80 -100 bar water jet at 100 – 150mm distance at angles from 0 to 90°. The fanless PC is based on the Intel Skylake ULT chipset running sixth generation Intel Core i5 and Celeron ULT processors with up to 32GB of DRAM. 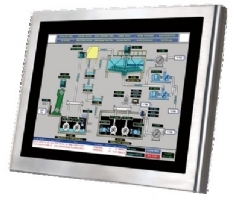 The integral 10 point touchscreen is fitted with an anti-UV protective coating. Two 10G LAN ports, two COM serial ports and two USB2.0 ports are provided as standard; the interface for all I/O is via M12 sealed connectors. Also externally accessible is a 2.5 inch SATAIII bay for mass storage. Expansion capability is a full-size PCIe Mini card slot, a full-size/half-size (PCIe x1 and USB 2.0 signals slot and a M.2 B-key slot. 12VDC @ 5A power-in is from an external 90 – 264 VAC PSU via a sealed connector.